I feel like such a broken record. I have been not doing great with my food for weeks and the scale is showing it. And in the last two weeks I’ve been super light on exercise. I can see this spiraling out of control. The scale this morning was a rude awakening. Hopefully it’s enough for me to EAT LESS! It seems so simple. I don’t know why I struggle so much. But I was talking with my friend about this and in the past the only thing I haven’t tried is to keep going and keep trying. So I will trudge on. In other news this week, we had parent teacher conferences on Monday, so I worked 11-7 with no kids. I got a lot done. The time went so fast and I was very efficient, but I could’ve used another day like that. I was very far behind for work. On Tuesday I took the day off to drive my mom to the airport and hang with Henry since she was going to be out of town with my dad. We dropped my mom off at the airport and then we went to Craig’s work. Henry used to be so shy, but he was holding court with Craig’s co-workers. I love watching him become this little person that I love more and more each and every day. I never lose sight of how lucky I am to have Henry and what a miracle he is. Sometimes it takes my breath away. Craig took the rest of the week off and did really fun stuff with Henry. They went to a local dairy that has kids stuff, animals, food and ice cream. They went to the park and to throw rocks into the water. On Friday they went to visit Craig’s parents in Columbus. 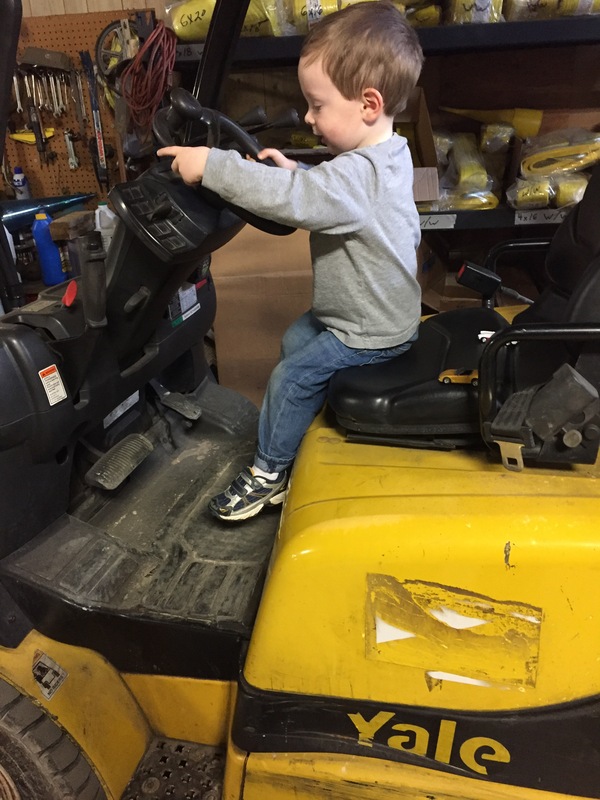 This is Henry on the forklift at his Papa’s shop. Today I am walking in a 5K my school is having for one of our students in the 9th grade who has leukemia. Their family is special to me. Her mom is the doctor who delivered Henry and also helped Craig and I when we had a miscarriage. And the girl who has cancer I happen to teach every year from 5th-8th grade. I hope everybody has a great weekend! I can’t believe it’s March! Our last day of school is May 25th!!! Woo hoo!